KEEP KNOCKING, EVEN IF THE DOOR IS CLOSED! Motivational Empowerment Speaker Richard Cross, creator of the transforming program “Energize Your Thoughts”, knows how to walk with kings yet keep the common touch. Growing up in an environment where limited resources and encouragement could have surely squashed his dreams, he decided to look beyond his limitations and strive for the success he so desired. His mother once told him, “Keep knocking, even if the door is closed!” Richard has been knocking on doors and breaking down barriers ever since. IT’S NOT WHAT PEOPLE TELL YOU, IT’S WHAT YOU BELIEVE! Re-energize your thinking to a productive thought pattern that positively impacts your life. Provide you with tools to help you get back on track with your goals as you are Empowered, Inspired and Challenged to go beyond your current limitations. Help you will develop key steps to making and keeping personal commitments. Inspire you to recognize and nurture your ability to maximize your performance as you unlock your personal potential. 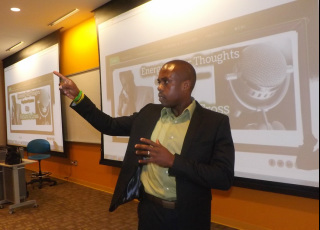 Richard passionately delivers his message, “Go Beyond Your Limitations” to both youth and adults. Having been the one told, “You’ll never make it,” Richard understands the desire to want to give up. He understands falling into the negative pit-falls others sometime set before you. He also understands perseverance, persistence, and the determination to never give up. When Richard shares his experiences with you, when he provides you the tools to go beyond your limitations, he is doing it from his heart. He keeps it real and shows both youth and adults that anyone can be a success!